Ohio’s north coast is known by birders world-wide for being a paradise of activity every spring as migrating birds stop for a rest at the many marsh lands. Last week we were up to the cottage and enjoying the brisk winds of late winter and decided to drive over to Magee Marsh to see if any eagles were nesting. It was great seeing so many active pairs nesting. 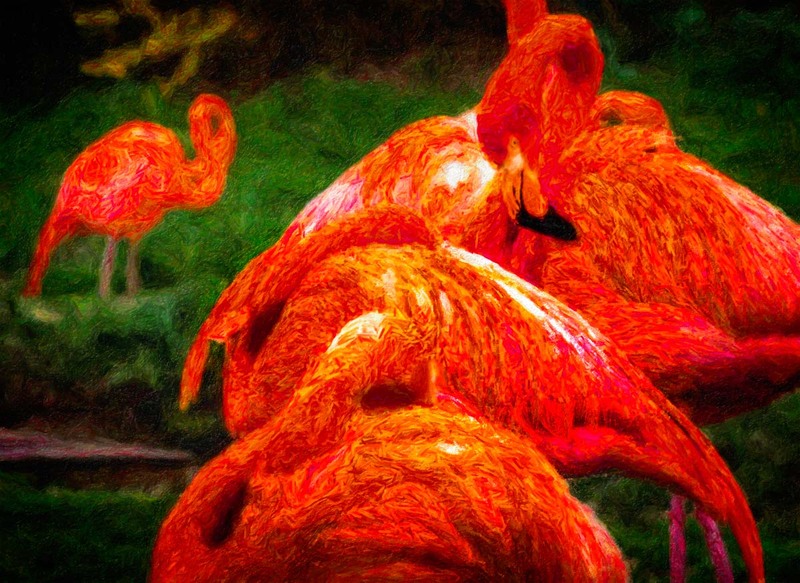 I say this only to put you in my mindset when on Saturday morning, a particularly foggy Saturday morning, I glanced out the window and saw my neighbor carrying two flamingos under each arm. Things that might seem unusual someplace else, at the lake nothing seems that far removed from normality. I watched Tom carrying these two large birds over to Jim’s side yard where an entire flock of flamingos were patiently waiting underneath one of Jim’s bird feeders. Back in the city, I used to feed the birds but the bird food also attracted squirrels. One year a pair of those squirrels decided to setup housekeeping in my attic by pulling back the attic vent and having babies nestled in all that warm pink insulation. How cute is that? Not very because one day one of these cute little babies chewed through 120 volt house wiring that not only gave him a shock, but shut down the power requiring an electrician to come out and repair the damage. Saying it was a nightmare doesn’t put that particular spring into perspective. So you see, I’m not a big friend of squirrels. I once asked Jim about why he liked to feed so many birds and of course those squirrels, who had already learned to shake one particular feeder just right, so they could get an extra helping of sunflower seed. Jim said he does it for his cats who spend the day watching all the activity through his large picture window. He said it was like his cats were watching TV. I thought maybe it would be cheaper to just hire someone to come in and train his cats to actually watch TV instead of going through I don’t know how many pounds of bird seed every week just so the cats could watch birds and squirrels. Tom set his two flamingos down under the feeders. It was quite the sight. Ten or twelve of the giant pink birds standing erect, patiently waiting. Tom, satisfied he had accomplished his goal, started back just as I stepped outside to investigate further. “Yeah. I heard last winter was really something. Naples was nice though. Didn’t miss the cold one bit.” he said glancing back at the birds. I nodded again and grinned. Tom gave a little wave as he headed back to his house. Good to be back.